You may or may not be aware that garlic prices are set to soar this season due to a poor harvest in some countries, and others capitalising on the gap between supply and demand. Many people feed garlic as a supplement, and it’s easy to see why. The natural, potent supplement is most commonly associated with respiratory health, but it can also be used to support digestion and to help keep flies and biting insects away during the summer season. 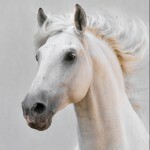 During winter, garlic makes a popular respiratory supplement, with many people adding a scoop or two to their horse’s feed each day. With garlic prices due to climb, we set to work creating a product that we could provide our customers. The supplement had to be excellent value for money and high quality, and it had to defy the price increases. We came up with Garlic Extract. 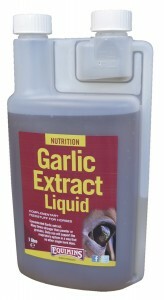 Garlic Extract is a concentrated garlic supplement that’s made from a tincture and garlic oil. When dried herbs are made into a tincture, their strength increases due to the process, and this allows us to bring you a strong, concentrated garlic supplement at an excellent price. At the moment (September 2016), we’re able to provide 1L of Garlic Extract for £7.49. Due to its strength, this will last for 100 days as horses receive just 10ml per day. Find out more about Garlic Extract here. Garlic is thought to repel ‘evil’. In films and books, vampires depict ‘evil’, but in horsey circles, flies and midges are definitely in the ‘evil’ category! Garlic was given to the pyramid builders in Egypt! It’s not a new crop – actually – it’s one of the oldest.